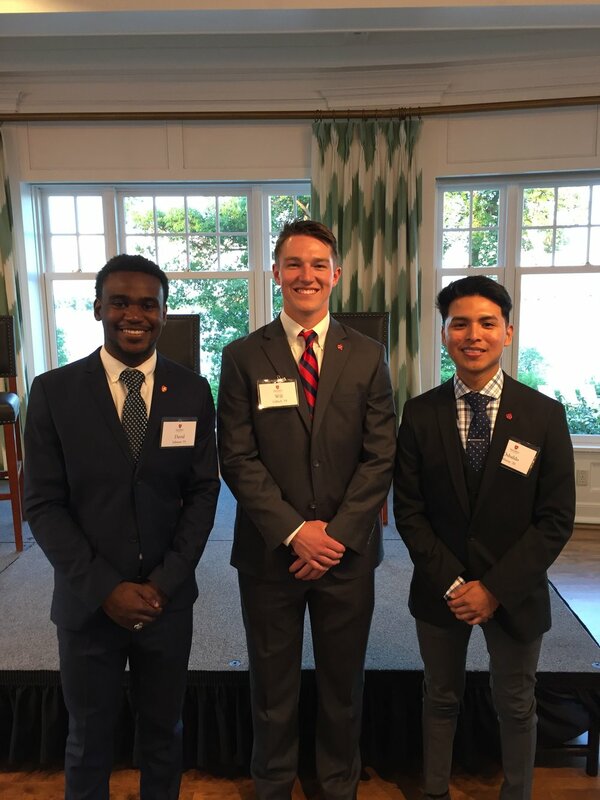 Three grateful Johnnies shared their stories with a roomful of Fellows Society benefactors back in June 2018 at The Minikahda Club in Minneapolis. Will is a legacy student from Lindstrom, Minn. His mother, Ann Knobbe Gillach ’90, is a Bennie and his father, Jim Gillach ’90, is a Johnnie, but at first Will wasn’t sure he wanted to follow them here. Will figured to make Ann happy, he would dutifully tour SJU, then decide. This proved to be a winning choice, as he is now deeply involved in life in Collegeville. While preparing for medical school, Will is an Entrepreneur Scholar and a wide receiver on the football team. He is chair of the senior class gift committee and serves on the Student Athletic Advisory Committee. Will thanked donors for their stewardship of time, connections and financial treasure shared with Saint John’s, including his Legacy Scholarship given by Fellows Society donors. He plans to give back generously as a graduate. David is from Nassau, Bahamas. His parents initially responded with uncertainty to his interest in a private college in Minnesota, until they saw his financial aid package. They soon realized that given his strong prospects for success at Saint John’s, SJU offered him the best return on investment of any college he considered. Today, he is an Entrepreneur Scholar and president of the 2018-19 Saint John’s Senate. David is grateful for scholarships given to him by Fellows Society donors. As a student senator and member of the senior class gift committee, David is a model of leadership and civic engagement among Johnnies and across cultures. Osbaldo is from Immokalee, Fla. His immigrant father, a skilled carpenter, wanted his son to become the first member of their family to graduate high school and college. Osbaldo worked construction with his dad, but the money wasn’t enough for the rigorous computer science programs for which he had prepared. Thanks to the persistence of Matt Beirne ’94, SJU’s director of admission, and a generous scholarship package funded by the Lyden-Marshall Immokalee Scholarship and Fellows Society donors, Osbaldo became a Johnnie. To save money, Osbaldo cut his own hair in his dorm room. After several compliments, word spread, and now Osbaldo can be found cutting hair every Friday night. His successful business has gained him Johnnie friends from all over the world. The Fellows Society is a distinguished group of alumni, parents and friends who set the pace with an annual gift of $1,000 or more to Student Fund. 100% of the Student Fund goes directly to scholarships for undergraduates at Saint John’s. In the recently ended 2017-18 fiscal year, 759 members of the Fellows Society gave $2,522,090 to the Student Fund, 81% of the total. You can join the Fellows Society with as little as $85/month, automatically paid from your checking account or credit card. Or, if you have an IRA and are required to take minimum distributions from it, talk with your financial advisor about gifting to SJU using the IRA charitable rollover.